As time goes, more and more network providers upgrade their LTE networks to LTE Advanced with the application of new LTE technology such as carrier aggregation and MIMO. Many customers want to surf at the faster speed than ever. So an LTE advanced router may be necessary for home or office. 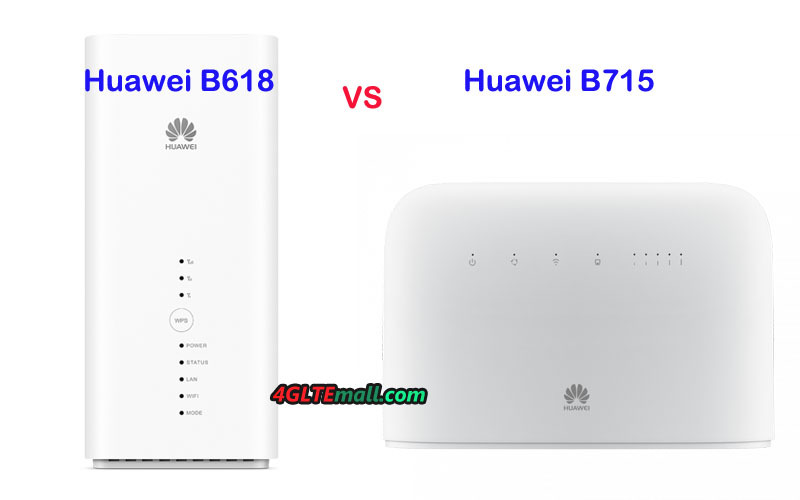 Huawei B618 and B715 are two latest popular routers for the LTE-A networks. Someone may ask: what’s the difference between Huawei B715 and B618? To buy one from them, which one is better? To answer this question, let’s have a compare of the two LTE WiFi routers. 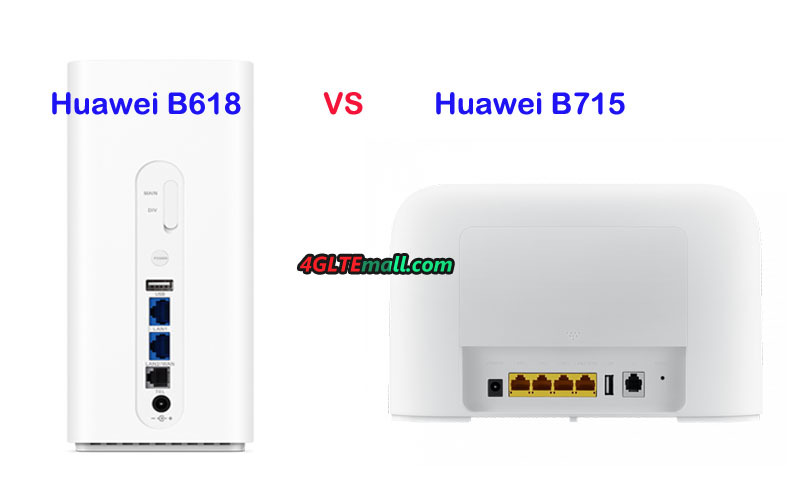 Huawei B715 and B618 router both could work well in Europe. Some network providers already introduced them to their contract plan. The Huawei B618 was available for EE, Telekom on the model number B618s-22d while B715 was available for LMV on the model number B715s-23c. 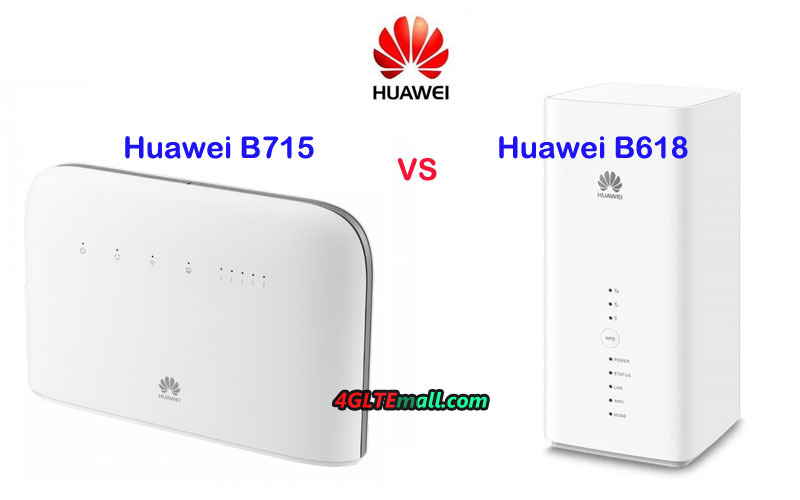 The Huawei B715s-23c looks like the common Huawei 4G WiFi router such as Huawei E5186 or Huawei B525, but Huawei B618 looks like a cube. You may think it’s a smart home device rather than an LTE-A wireless router. On the front of Huawei B715s-23c, there are few indicators for power, data transmission, WiFi, connected device, and signal. On the back, there are 4 RJ45 ports for LAN, one of which is for WAN/LAN. And one RJ11 port is available for connecting telephone. Huawei B618s-22d LTE router has only one port for LAN/WAN and another one for LAN only. They both have a USB 2.0 port for sharing file. Like other Huawei LTE routers, the Huawei B715s-23c has two SMA connectors for external antenna while the Huawei B618s-22d WiFi router has two TS-9 connectors for 4G external antennas. They both have the same feature that the SIM card slot is at the bottom of the body. To know more about the technical specs of the two LTE-A router, the table below will give clear information about the chipset, category, data rates, supported frequency bands, interfaces, and prices etc..
Chipset HiSilicon Balong 750 ? From the appearance, we can see both the Huawei B618s-22d and B715s-23c are cool, but I personally love Huawei B618s-22d better. But if you want the WiFi router to have more Ethernet ports to connect your desktop, the Huawei B715s-23c may be better. From the specs, we can see Huawei B618s-22d support higher level LTE networks with faster LTE downlink & uplink speeds. But if you need the LTE router to work for more LTE frequency bands especially for band 32 or band 28, Huawei B715s-23c should be taken into consideration. And the Huawei B618s-22d with advanced LTE technologies would be more expensive, if you don’t care about the price, Huawei B618s-22d would be the right one for your home or office.